Away from the megastar hoopla of the televised 2009 Grammy awards, a few other gongs were handed out - and one was a posthumous award for Clarence 'Leo' Fender. 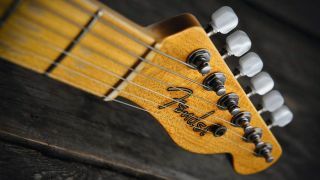 Before the main Grammy show of 8 February, Leo Fender was posthumously honoured with the Academy's Technical Award during a lower-key ceremony on 7 February. Leo Fender died in 1991. Bruce Springsteen, Keith Richards, The Edge and Eric Clapton have all paid tribute to the man whose company invented the Stratocaster, Telecaster, numerous classic amps and also set a benchmark for mass-scale guitar building. "The first time I saw one was in Jerry Lee Lewis' band in some footage from [the 1958 film] High School Confidential. His bass player was playing a Fender Jazz Bass. I'd never seen anything like that solidbody guitar before. That was it for me. It was the perfect design. It looked like a spaceship. "I loved that it was new and exciting and like science fiction… He had a very small budget to make those early guitars, so every decision he made about design was about function… That's why that guitar is perfect. He didn't care what it looked like; it was about function. That's the cornerstone of why the Strat and the Tele are what they are, and why they cannot be improved on." "There is something completely unique about the Strat. What's really special is that something so simple and so mass-produced should end up with such a kind of subtle and unique and amazing sound quality. All of the guitars that had gone before - the great Gretsches, the big Gibson archtop guitars - were all complex designs that were much more like cellos or violins, construction-wise. But with the Strat, you get this plank of wood with a neck stuck into it. Yet it just sings. "It's an incredibly inspiring instrument. . . . It's like the '57 Chevy of guitars. It's the pinnacle of something that was very special about that time in history." "My first opportunity to strike the strings on a guitar was on a Stratocaster. My first instrument was a Gibson single pickup, single cutaway Melody Maker. Make no mistake: it's a fine instrument in its own right. Yet I don't think there was ever one soloist or instrumentalist that didn't at some point have their sights set on a Strat, including me and everybody I knew. "The Strat is really the global cornerstone, the reference point of the perception of the contemporary electric guitar… Just about everything up till now has aimed to equal or improve upon the Stratocaster, but in the words of a dear musician buddy of mine: 'How fancy do you think you really have to get?" Answer: Get a Strat and you can do it all. "That guitar grabbed a hold of me and I'm still hung on it… Playing any other guitar is like putting on a glove that's too small, then putting one on that you've been wearing for five years… If you see me change from a Strat, it means I done broke a string." "The Stratocaster is a great and iconic instrument… a guitar that has contributed greatly to rock 'n' roll, a fine and wonderful instrument. It's just not a Tele." "There's a beautiful individuality about Leo's work. We're talking about a guy who made guitars in Fullerton, California, and changed the way we listen to music. It's an amazing thing."